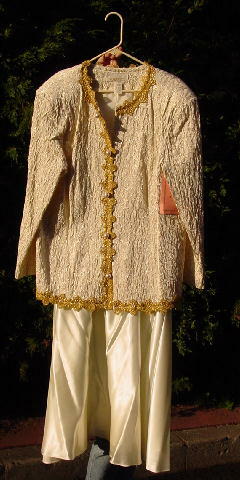 This new ivory and gold-tone outfit has a jacket that is 80% acetate, 11% nylon, and 9% metal. 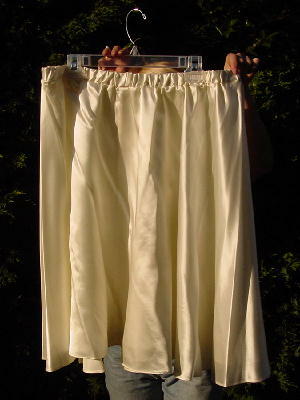 The full skirt is 100% acetate, and the linings are also 100% acetate. 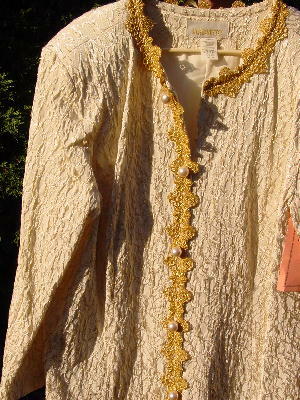 The jacket has 5 large faux pearl faux buttons. There are 5 hidden buttons. 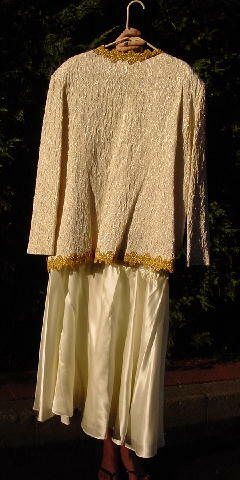 There is gold embroidery around the neck, down the front, and around the bottom. The tag is still attached to the jacket. The jacket has a freeform metallic thread line pattern. A model bought it as a present for her mother to wear to the model's wedding, but her mom had lost a lot of weight.